The colorful paintings and the graceful sculptures of Rajasthan are manifestations of the people's love for color and celebration. The state has contributed a lot to the richness of the Indian Art. The people of Rajasthan love to add a beautiful aura to their homes through their own fascinating creations—paintings and sculptures. This trend of decoration dates back to the days when Rajasthan was ruled by royal families. The erstwhile Maharajas patronized these art forms and as a result many great artists flourished in those days. 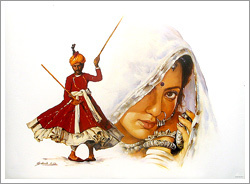 The paintings and sculptures of Rajasthan are famous all over the world for their distinctive style and beauty. The paintings of Rajasthan have two different colors to their style — the former school of miniature paintings whose growth intensified in courts all over north India and the Deccan, and the folk style which is unique to Rajasthan. The glorious 16th century saw the rise in different schools of paintings such as the Mewar school, the Bundi-Kota Kalam, the Jaipur, Bikaner, Kishengarh and the Marwar schools. Miniature paintings are made in Mughal or Rajasthani styles. The Rajasthani miniatures are different from the Mughal ones in terms of color and compositions. They use bright colors and bold compositions and touch several themes such as the kings, religion, and secular whereas the Mughal miniatures were restricted to court scenes and emperors. The most admired Rajasthani painting is one depicting Krishna Leela. Pichhwais of Nathdwara are purely dedicated to Lord Krishna. The folk style of paintings is divided into two styles. Phads—they are in the form of a scroll painted on a big canvas. They depict the legends of Pabuji Ramdeo of the Rabari tribe, and his black mare. The colors used are bright orange, red and black. Pichwais—they are decorative curtain cloths used as a background for divine images or idols in a place of worship. The styles vary from brocaded, block printed, embroidered or golden thread work. The Rajasthanis have long perfected the art of transforming clay into amazing Sculptures. It is one of the most impressive arts of the state. It reached great height in the medieval period. The mesmerizing art form can be seen in the palaces, forts, temples, havelis and step wells of Rajasthan. Using simple tools like chisel, hammer and borer they create sculptures whose beauty sometimes goes beyond our imagination. The text of Shilpashastra and Manasara serve as their guidelines for creating magic with clay. Jaipur is famous for its marble images and it can be best seen in Dilwara temples. Havelis are finely carved out in sandstone. Columns, jharokhas (windows) eaves, brackets, domes, cupolas and arches are meticulously carved. Stand-alone work of sculptures can be seen in form of various items like stone statues, water fountains, vases, planters, tables, and other decorative items.